IT problem-spotter BigPanda plans to announce Wednesday that it brought in a $7 million series A funding round and is launching its core product to the general public. The new funding round, led by Mayfield and Sequoia Capital, brings the startup’s total investment to $8.5 million. Today’s web-scale companies typically load up several different types of data-siphoning and deployment services into their IT infrastructure to streamline the performance of their data centers. These services include configuration-management tools like Puppet (see disclosure), log-management services like [company]Splunk[/company] and application-monitoring services like [company]New Relic[/company]. And it’s not like these services are generating bite-sized chunks of data. The amount of information being funneled into organizations from each of these services can overwhelm the IT staff, explained BigPanda founder and CEO Assaf Resnick. “Suddenly you have six or seven monitoring dashboards with alerts and none of those dashboards speak the same language,” said Resnick. While these data-gleaning tools help IT staff be aware of potential infrastructure-related problems, the enormous amount of data generated can make it hard for IT staff to prioritize what incidents are more serious than others. BigPanda aggregates all of the data from these different services and runs algorithms on top of the info to determine what problems warrant more attention than others. Instead of IT staff having to deal with hundreds of data-center-related incidents, BigPanda can cut that figure down to around 10 or 15 critical problems so they can see the forest through the trees. The startup can hook up its cloud-based system, which runs on Amazon Web Services, to services like New Relic and Nagios. If a company has an on-premise data-gathering service, users can install a software agent on the master server so that BigPanda can aggregate that data. 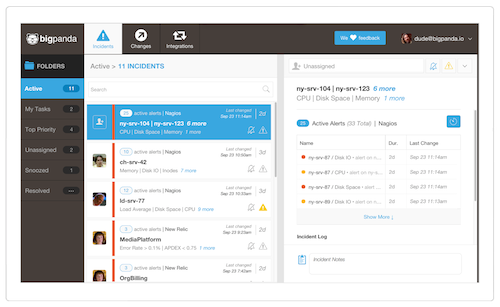 Incident management is a growing area in the enterprise right now with companies like [company]Moogsoft[/company] and [company]PagerDuty[/company] recently touting their own funding rounds. What separates BigPanda from the pack is the startup’s aim to be “more of a central command-and-control console” rather than focusing on notifications, said Resnick. The Mountain View-based startup has 15 employees and plans to bulk up on staff with the funding round. Post and thumbnail images courtesy of Shutterstock user COBRASoft.